The Sheraton offers a Natural Ortho pocket 2000 mattress that is Possibly one of the best value mattresses on our website but from a company you might not have heard of Highgrove. Highgrove are a independent manufacturer of good quality well made beds and mattresses, they do not skimp on the product and tailor their products very well. Take the Sheraton a 2000 pocket spring mattress with Chatsworth lambswool and cotton fillings on both sides of the mattress so is fully turnable. 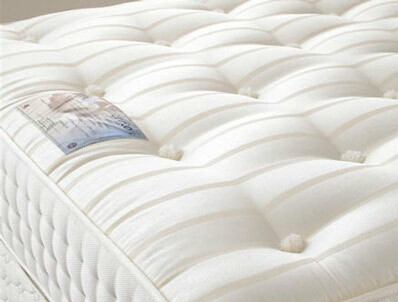 It has hand tufting to create a medium to firm feel ( although the mattress is labelled as medium) the mattress offers a firmer feel on a hard base and comes with a chatsworth cream stripe damask fabric and a 5 year makers warranty. Double and king size are normally in stock for quick delivery , other sizes 7-10 days, why not try this product out as it offers great value for money.